Boolprop! • View topic - Birth Announcements! Alan McKinley had an alien baby named Orion. 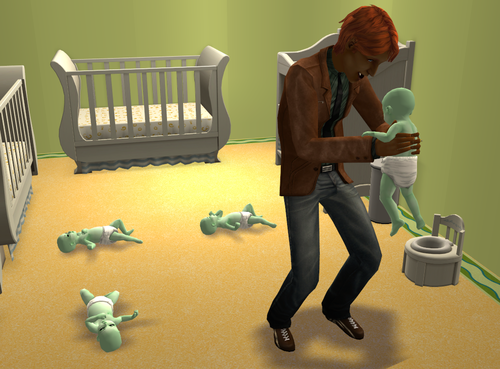 ...I hope I honestly never go through that in real life...No thank you to triplets. Meet Erica, Fiona, and Ursula (Born in that order) Simself. Burt and Quinn Proudmoore just welcomed their first "official" child, a son named Cal. Bandele and Vincent Mason just welcomed their first children, a girl named Callia and a son named Calvin. Bea and Prof. Timothy Sparrow just welcomed their first child, a boy named Camden. Anne and Calvin Fletcher just welcomed two more girls into their brood - Bernadette and Bernadine. Anne wants to marry off six of them, so she now only needs two more - assuming nothing happens to the current ones. Right now we are at 3 girls and 1 boy in this house lol. Andy and Natalie Proudmoore just welcomed their last child (hopefully) a son (FINALLY) named Barton. Blue and Dorian Avery just welcomed their second child, a girl named Callista. May and Robyn Wong welcomed five children last night, fulfilling both of their wants to have ten children! Robyn first gave birth to a son named Hawk, who is the only of their children to inherit May's green skin. An hour later, May gave birth to the couple's first and only daughter, Raven. Three days later, May was up first with another son named Finch. Then Robyn had twins, Lonan and Sparrow. The couple has five older boys named Lark, Jay, Phoenix, Starling and Vireo. Robyn now wishes to have 20 grandchildren, which will take awhile as their oldest is only a few days into teendom. Cleo Shikibu of Riverblossom Hills grew tired of waiting for Mr. Right to start her family, and adopted a kindergartener named Pax. So far mother and son have taken a couple days off to bond (read: I'm rebuilding the whole neighborhood and haven't gotten her job back,) and have chosen a nautical theme for his room. Adrianna and Drake Dennis welcomed a baby girl named Barretta Dennis into the world. Xenia and Shilah Pearce had a son named Scorpius, and Shilah was abducted by aliens and will be giving birth to his alien baby at the beginning of their next round. ... and I have a set of twins due in the next rotation, and a sibling on the way for Phoebe, and pretty soon my BACC is going to have as many children as adults. 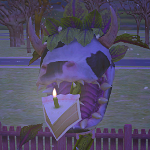 Born (on mother's day no less,) today are twins Taylor and Austin Du Vall, to New Edenia Trainee Mayor Whitney Du Vall. They were sired by Jasen Ultra, nee Oryx, immediately prior to his engagement to Denise Ultra. The twins share their parents' red hair, and they both appear to have skin tones between those of their parents. (I have a geneticized set with at least 12 gradations.) Taylor has her mama's blue eyes, Austin has his father's dark grey. The twins were also welcomed by their aunt, Ashleigh Du Vall, and will eventually meet their half-sister Phoebe Ultra. Robin Ultra was born to Jasen Ultra and Denise Ultra! He has his mom's black hair, his dad's dark grey eyes, and another in the middle skin tone, though this one has a bit of a weird scalp on babies. Toddler sister Phoebe Ultra was not impressed, and his cousin Merideth Mawar (daughter of Brynne Mawar and Mikael (Ultra) Mawar,) aged up to tot the same day. Since I'm running my game with last names inherited matrilineally, I don't currently have any duplicate households with the same last name... but I have three babies on the way in the game right now. I played a few days ago but just got around to queuing up the posts on my tumblr. Oops. Anyway, Eric and Katriona Wilde gave birth to daughter Allison. And Kat is pregnant again. I'm going for the "Have 10 Children" want for Kat because I've never done it, or if I have it was yeeeeeears ago. Cassandra Goth gave birth to her first baby Draven Goth, his father is Don Lothario however Don doesn’t know about the baby as Cassie found out after he left her at the alter...whoops! Cynthia and Robert Kim have also welcomed their second baby boy, little Denver Kim. His brother Justin isnn’t too sure about having a new brother. Ashleigh Mawar-Du Vall and Casilda Lane are both pregnant again. Ashleigh's is with Gibson again (perhaps unsurprisingly) and Casilda's is via the PT. I have restarted Pleasantview so going to be lots of babies in my game!! Cassandra and Don Lothario welcomed a beautiful baby girl, little Lily Lothario. So far she looks just like mummy but will have to wait until she gets older to hopefully see some of her handsome father’s features. I started a new 'hood with three of my favorite premade ladies (Cassandra Goth, Titania Summerdream, and Natasha Una) and some other premades as townies. Titania got engaged to Oberon Gossamer and had him move in, but no babies for them yet. Natasha Una and Ripp Grunt had a girl named Brie Una. Natasha is also alien pregnant, so another baby will be coming any day now. Crystal Vu-Goth gave birth to Cassandra Goth's daughter, Amelia Goth. And just like Natasha, Cassandra is also alien pregnant. I played more and Titania Summerdream gave birth to baby boy Elijah. Father is her husband Puck (luckily not her son in this 'hood...that would be creepy). Approx 8-9 months after the end of her marriage to Mortimer Goth, Dina Caliente gave birth to a little girl, Athina Caliente. She has been paid a huge sum of money to keep the child away from the Goth family, so Dina is raising her little girl alone in a beautiful home near the sea. Natasha Una gave birth to twins Orla and Olive. She and her husband Ripp have tow older girls (well one daughter together and then Natasha had an alien child), and I don't plan on them having any more kids.